Researchers: Ping He, Qi Wang, Kaihua Ding, Rong Zou, China University of Geosciences; Eric A. Hetland, University of Michigan; and Yangmao Wen, Wuhan University. 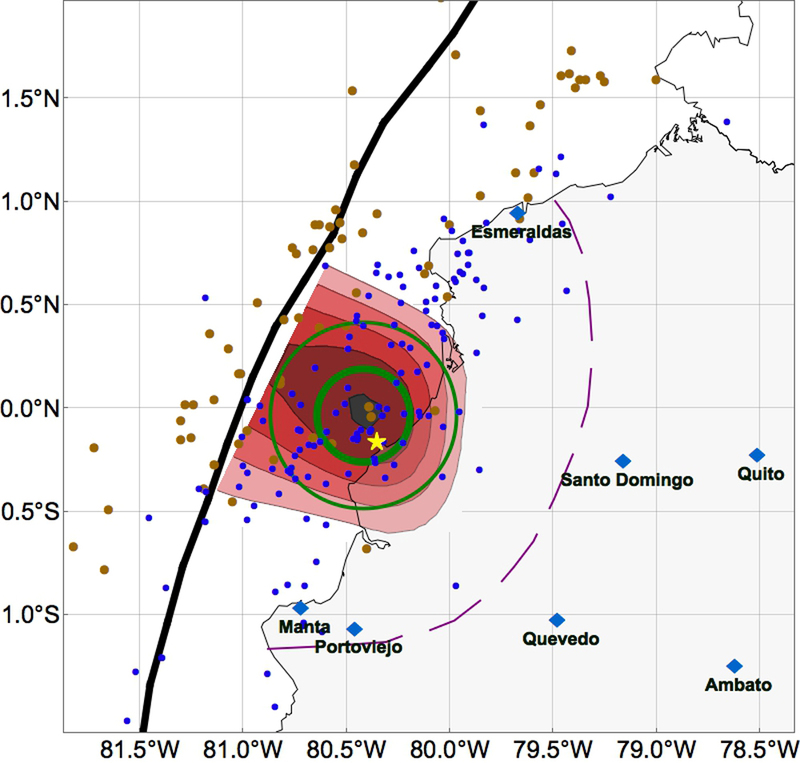 A moment magnitude 7.8 earthquake ruptured a major subduction zone boundary between the Nazca and the South American plates just offshore of Ecuador on 16 April 2016. 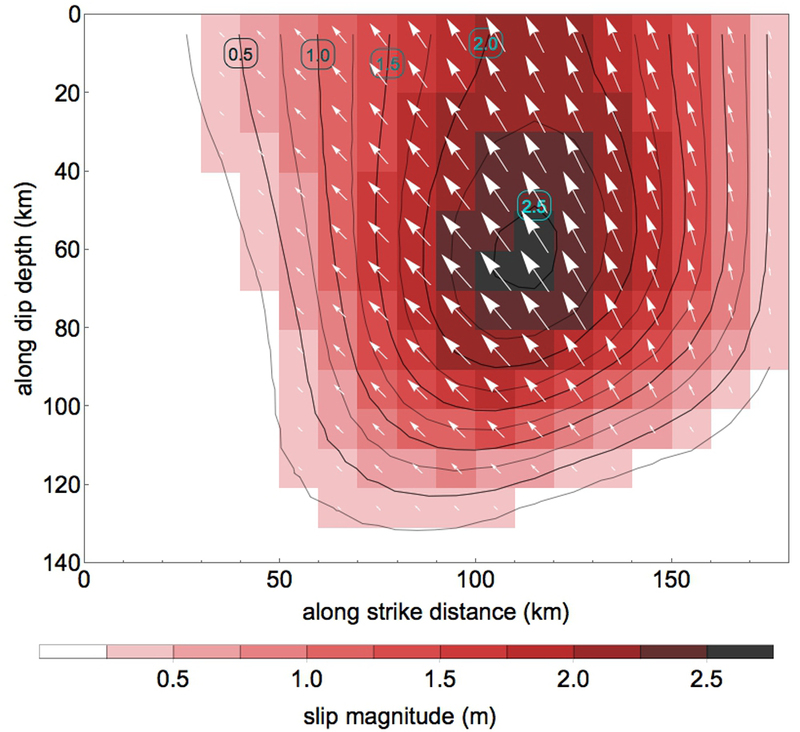 Synthetic aperture radar (SAR) data and model analysis show about 2.5 meters of slip at about 20 kilometers depth on a fault dipping 17 degrees to the east. The event likely ruptured the same area as the magnitude 7.8 1942 earthquake as well as part of the area ruptured in the magnitude 8.8 1906 event. Three events repeatedly ruptured only one region of the plate boundary over a 110-year timeframe suggesting a shorter repeat time for such events and a nearby seismic gap that might bear watching for future earthquakes. The Nazca plate is subducting beneath the South American plate along the west coast of South America. The tectonics along this major plate boundary create the high mountains, the active volcanoes and the numerous earthquakes near the western coastlines of several countries. Large to very large earthquakes have been recorded just offshore of Ecuador, including the moment magnitude (Mw) 8.8 earthquake in 1906, Mw 7.8 in 1942, Mw 7.7 in 1958, Mw 8.2 in 1979 and Mw 7.1 in 1998. All of the events after 1906, occurred within the inferred rupture zone of the much larger event and it is likely that the 1906 earthquake ruptured many segments along the plate boundary. On 16 April 2016, a Mw 7.8 earthquake occurred offshore and south of Esmeraldas, Ecuador, within the 1906 earthquake rupture zone and near the peak slip of the 1942 event. This is the first large earthquake in the region to be observed with Sentinel-1A synthetic aperture radar (SAR) imagery. The data provides an opportunity to determine the amount and direction of the slip and the geometry of the fault at depth. Images before the event are differenced from images taken about one week after the event to determine the amount of surface motion during the earthquake on land. Although there are no observations in the offshore region, the land deformation shows enough symmetry to infer the associated offshore motion and determine the full extent of the rupture. Analysis of the observations suggest the 16 April 2016 earthquake ruptured the same region of the fault as the 1942 event and part of the region of the rupture in the 1906 event. The 2016 event caused about 2.5 meters of slip at about 20 kilometers depth. This sequence of events may mean that the repeat time for a large magnitude earthquake in the same area may be as short as 55 years, compared to a previous estimate of 110 to 170 years. The event left a seismic gap and this gap may be building up stress that may break in a future event. The Nazca plate is rapidly converging with the South American plate, creating these many large events and calling for careful observation and preparedness. Ping He, Eric A. Hetland, Qi Wang, Kaihua Ding, Yangmao Wen, and Rong Zou (2017), Coseismic Slip in the 2016 Mw 7.8 Ecuador Earthquake Imaged from Sentinel-1A Radar Interferometry, Seismol. Res. Letts. 88, 277-286, doi:10.1785/0220160151.